Nothing much to report today. After the chicken farm tour yesterday, I crashed at my uncle’s place. I decided to stay in. That meant sitting at my uncle’s place doing laundry, editing and compressing pictures, and catching up on writing. Between surfing the internet and working the washing machine, I pounded out word after word on chickens and, more importantly, the scuba dive trip. I finished the chicken entry, but have not finished the dive trip. It’s taking a lot longer than I’d hoped. I do have a couple interesting tidbits from my day in. First, the washing machine. The one here uses a hose in the bathroom to fill up the washing drum. You dump in the soap in the drum, then drop in your clothes and set how long you want the machine to agitate. Here’s where it gets different. 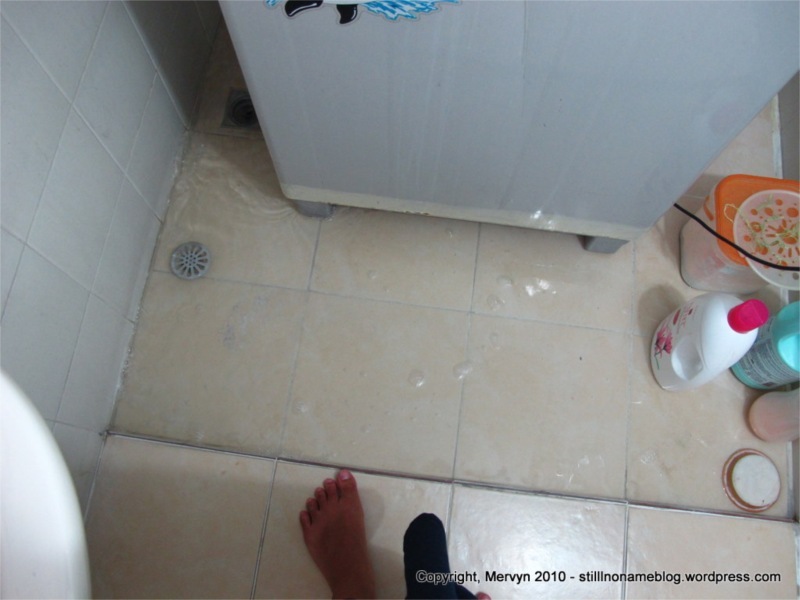 When the machine is done sloshing around your clothes in soapy water, you drain the machine by flipping a switch. A valve opens on the bottom of the drum and the machine drains onto the floor. A drain takes all that water away. This process explains a previous mystery: why is there a lip on the bathroom floor? The machine drains faster than the room will drain. If you didn’t have the lip, water would flood the toilet area and the hall outside. The lip prevents that from happening. 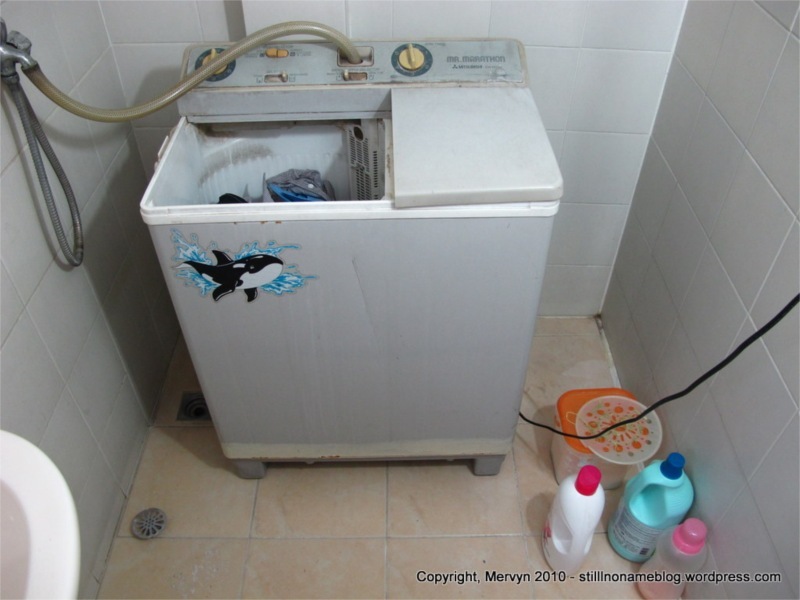 After the machine has drained, you take your soapy clothes and put them in a smaller drum on the right side of the machine. That drum spins the water out of the clothes. 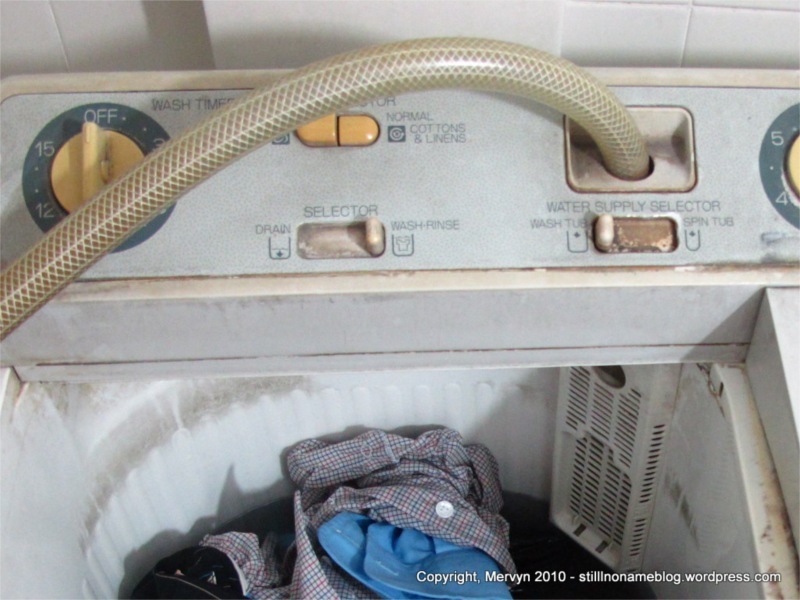 Then, you pull the clothes out of the spinner, dump them back into the main drum on the left, flip a switch to close the drain, then fill the thing back up again with water, this time for the rinse cycle. You set the machine to agitate again. Once that’s through, you put the wet clothes back in the spinner, wring the water out, then pull the clothes out and hang them on a line. It’s a much more time intensive process than the all-in-one washing machines back home. It’s a damn sight better than what I’ve been able to do by hand. My cargos are as clean as they’ve been since I got here. 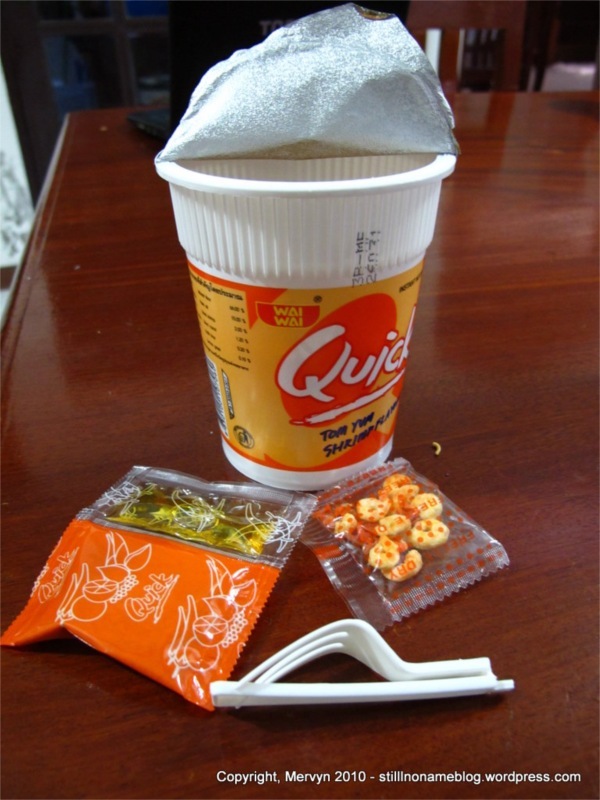 For lunch I had a cup of noodles, Thai style. It came with little shrimps, an oil packet, and a chili packet. Best of all, it came with a little folded up fork. This is brilliant. I didn’t even need to find a utensil because one was included for me. America, we need this innovation at home. 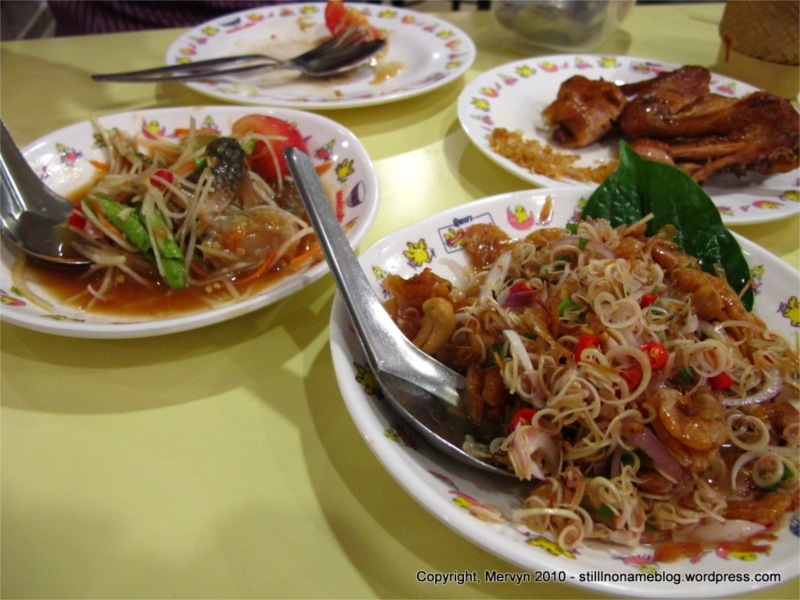 When my aunt and uncle got home, we went to dinner and pigged out on Thai fried chicken, papaya salad, seafood papaya salad, fish cake, and fried fish. Note, you’re allowed to eat fried chicken with your hands here. That’s what my uncle insisted that I do. Being Filipino, he didn’t have to ask me twice. 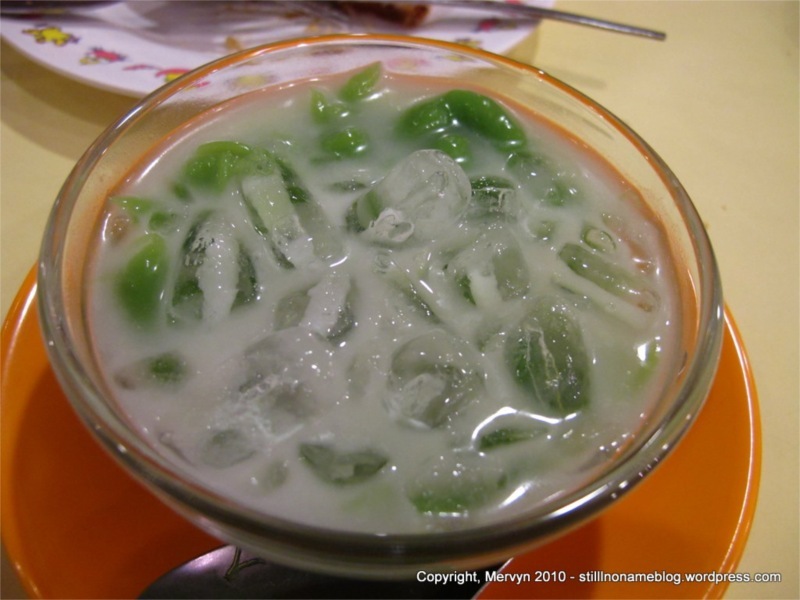 For dessert I had green rice noodle things in coconut milk, cream, and ice. My aunt thought it was too sweet. I’m a sugar junky, so I thought it was just right. Afterwards, we visited my uncle’s daughter and her husband. 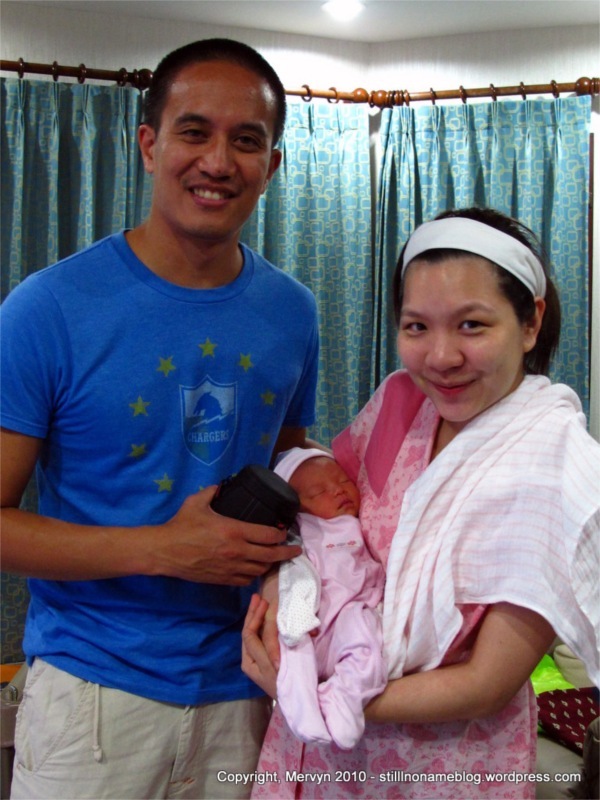 They’d just given my uncle and aunt their first grandchild. They wanted to drop by and tell baby goodnight. A nice gesture, I thought, but I couldn’t help but wonder whether grandkid #2 would get the same treatment when he or she eventually came along. I have a feeling kid #1 doesn’t care. I know I didn’t (no offense, bro). And that’s that. Wish I had more, but some vacation days are more work than they are fun. When I read that last sentence over, it makes no kinda sense. I may have broken my vacation. ← Day 34 – Chicken. Factories. You will not understand your aunt and uncle’s reaction to their first grandchild until you have one of your own (I pray that you are so blessed). As for the contrast between first and second – that occurs also with children, and until we stop being human, I don’t know how it can be any different….. I plan on neglecting all my children equally. That is, if I ever have any. Glad you’re enjoying my work so far. Hope you keep reading! I would think with your uncle being the chicken executive he could afford a nicer washing machine!! Then again, I’m sure he does not confer with the housekeeper that probably does the laundry. Even though it’s 2015 I hve enjoyed reading your blog for the past two days at my boring job in Phnom Penh! Cheers! !